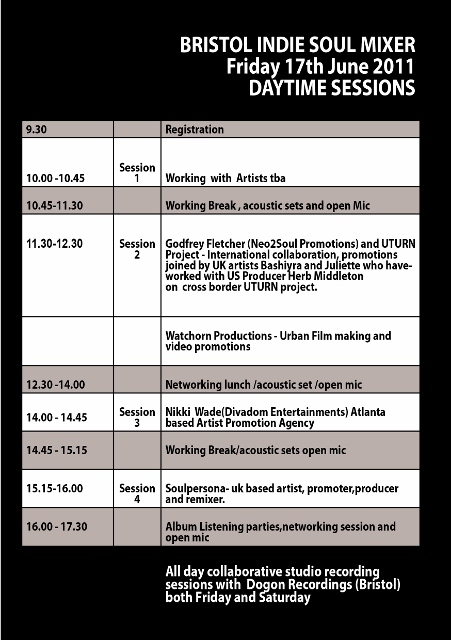 The Indie Soul Mixer is jumping….Nikki Wade, Catt Gallop, La Sonya Gunter, Khiry Wade, Rose, Zion Flex, Celestine, D Nyce, work in the studio today, intervied with 98FM, performed at Trinity Centre & finished the night rehearsing for tomorrow. Canteen in Bristol 19/6/2011 15:30 Shout to Mike Ashley for throwing the best Mixer in the world. John H Gordon Awww wish I could be there! La Sonya Gunter ‎@John H Gordon hey John, it was an awesome show! Having a great time. Thanks so much to Mike Ashley, David Nathan, Godfrey Fletcher, Ujima Radio and all the fellow artists Keyonne and I have met while we have been here! It is been a blast! More to thank soon! Cheers! IS HAVING BREAKFAST IN BRISTOL THIS MORNING!!!!!! WE HAD SOME AMAZING TALENT FROM ALL OVER THE GLOBE!!!!!! OH! Girl I came here and sang my heart out!. It’s funny, people know my music here. My stuff gets some good airplay. i was overwhelmed with all the support i have here in the UK. THIS IS WHAT ITS ALL ABOUT MAYN!!!! SOUL MUSIC!! !, FUN TIMES!!! IT WAS A PLEASURE 2 B PART OF THIS WIV ALL THESE TALENTED PEOPLE!!! Has had the most amazing weekend with the Indie Soul Mixer. Not only have I meet the most talented musicians from Bristol & the USA, but I have also made new friends! Thank you so much to Mike Ashley & Beki Wills for putting this together. Roll on next years ISM! Tom Chappell Yes, Trish and I are feeling the same…What warm spirits and vibes from everybody. Love and Peace to all of you. WINDING DOWN & WRAPPING UP FROM A WONDERFUL TIME HERE IN THE UK…GREAT SHOWS, GREAT ARTISTS, GREAT ENERGY! CAN’T WAIT 2 COME BACK BRISTOL…WOULD LOVE 2 STAY (but its 2 d*mn cold & i gots 2 have my sunshine! lololol) HOWEVER, IT’S TIME 2 COME HOME 2 THE “A”! BREAKIN’ IT DOWN IN BRISTOL BABY! Richard Price Mike and Beki the intimacy of the whole event was for me a genuine blessing. It was one of the most inspiring and educational weekends of my life. Thank you so much and I can only echo your praise for Jay and the band – they really were amazing! La Sonya Gunter M, you are near and dear to my heart. I am grateful for every bit of supoort and kindness you have shown. It was a blessing to get to see you.meet Beiki and work with so many talent artists from the US and The UK. I CAN’t WAIT FOR THE NEXT ONE! Misty Sharp We love you Mike Ashley. Thank you for being you and all you do. You throw the Best Mixer Ever. Positive energy, good vibes, much love. Mike Ashley & Beki Wills – stand up & take a bow ! On behalf of someone who was lucky enough to enjoy a fantastic evening on Saturday at the Trinity, amongst the Indie Soul Mixer family, talking to & listening to some amazing performers, wh…at you both managed to put together was tremendous. The concept is to be applauded – the support that you got from the UK was pathetic, & the so called ‘supporters of new independent Soul’ music should take a long hard look at themselves as this was a wonderful opportunity for them to ‘give a little back’. As you’ve said Mike, the sound was stunning & the back up from Jay Wilcox & his band was brilliant – you called it ‘vibing off each other’ – I’d say that there were 3 very talented musicians more than able to pick up on any groove ! It would be wrong to single out any particular act as I’d missed the Friday evening, but I thoroughly enjoyed Celestine & Nathan Watson, who came across really well. The finale was really good fun & the added bonus of picking up some unreleased music from the lovely LaSonya Gunter . . . oh yes, the artists were there very much to promote themselves as well, so ‘freebies’ were around – was fantastic. The whole show was masterfully MC’d by Ms Nikki Wade, what a character, & it was quite obvious that the lady was simply having fun . . . ‘come & join us in Atlanta in October, y’all’ . . . now there’s a thought ! Positives – lots, without doubt, simply the fact that all these artists had made it over from the US to network & perform with other likeminded UK artists, is a huge feather in Mike’s hat. Yes – of course there were negatives too & as a new event there were always going to be, but it’s a brave man who undertakes something like this in the first place, but it’s an honest man who sticks up his hand to admit those mistakes. So would I go again, yes – without doubt. Can it get better, yes – of course it can, but only with a lot more of the UK Soul scene’s support. Would you enjoy it, again yes – without doubt, simply because the overall vibe from the artists was so positive & exciting. Come on UK, stand up for new music if you believe in it, as we’ve all moaned about the lack of exposure over the last few years, as here is something that can grow & become a wonderful platform for all these exciting new live acts. Support Mike & Beki – support the next Indie Soul Mixer in 2012 !! Nathaniel Lewis Mike! Can I get on the next one…? Simone Sheckles Oh how sweet it would have been to be there. Thank God for Hope. I Hope to be a part next time. sure no worries mike, I really had a great time and made some lovely new contacts. ill call you to let you know ive emailed the bits over to you. I would like to express my deepest and heartfelt thanks to all the people who participated in the UK’s first Indie Soul Mixer in Bristol, and, with respect to the UK participants, especially to the people who travelled from the USA to support and participate in the event. The event succeeded because of the positive energy of those that attended, strong relationships and friendships were made, and foundations were built to take it to the next level –whether that is for the Mixer as an event or for artists collaborations that will evolve, it does not matter. I hold immense pride for the artists who pass through the Indie Soul Mixer family whether in the US or the UK. The object of the exercise from day one is to help artists grow and build through education, collaboration, mutual cooperation and understanding – if as a movement or a group we grow we will individually succeed, that was my belief when I started this 6 years ago and it remains equally strong now. Of course, some individuals will seek and do nurture their own goals from the outside, but this in the long term will not help them, or the artists, or the industry, it will only give rise to short term gratification . It is fine for people to help themselves, we all do it – but there is a bigger picture here and that is to increase the awareness of Soul Music and the Cultural identity that surrounds it. The event was not without its difficulties but overall I do not think there is too much that we would have done differently, there are tweaks to be made, improvements in some areas, bits we missed and should have covered and so on but these will all come out in the debrief. That said i take my strength from the positive energy that was created throughout the event, whether in individual discussions, small groups, on stage, within the event or outside. The concept/ the name – We did not choose the name Indie Soul Mixer – it evolved over time. Indie Soul is now an accepted (sub) genre of our music and we have throughout our history had a hand in that. People in the US know it, use it and it has meaning. In the UK it has a meaning within a small grouping in the Soul Community. However it is clear that the general public have no idea what it is and it caused confusion. This will change- just google it – it is accepted broadly on music websites so we cannot change it – after all it is what we represent. We had so many offers to help that we thought we could rely on people to do stuff. Often it didn’t materialise. In some cases that will have been down to us but in most cases i don’t think it was. I don’t need to or want to go into details or call people out over this as I am sure intentions were good. We are most appreciative of the people who helped, if only in a small way, help is help, and we love them for that. Those that didn’t also know who they are, so let’s leave it at that. We are also a little disappointed at the so called Soul Community or Soul Scene in the UK. An event which I would have thought ought to have been to the forefront of their minds was effectively totally blanked by them with just a few exceptions. There is also evidence of direct and divisive actions by certain people. As if I am some kind of threat?? If people just want to go and play their records and have a party and not support the artists that create then that it absolutely fine by me but that’s not the agenda of Indie Soul Mixer. Maybe it is my fault for not cosying up to the machinations of the Soul Scene, but that’s not me either – I have long since said and it has been recorded such that a ‘scene’ is a barrier, barriers are detrimental to artists so we don’t deal with them. All I know is that i have put time, effort and money into doing what I do. The people, artists included, to me are real people, they are not ‘facebook’ (or some other social networking site) ‘friends’. They are people i have real connections with and in many cases would regard them as friends and not just contacts. I am trying to have a real impact on their careers, not just do something for my own (short term) gratification or ego. It is disappointing that we didn’t get more a bigger attendance. However overriding that is the aim of Indie Soul Mixer to promote and assist the artist. A bigger audience may have superficially helped them more but actually stronger connections were made by being smaller. For the first one I am happy. There was also an intent on my part to make the event ‘Bristol-centric’, something that the city could embrace, build on and be proud of. Sadly both from the education side and the event side we were left disappointed by the lack of committment to the event- I would have expected the City and the Educators would have had some kind of interest in an event supporting grass roots and aspiring artists – it seems their priorities lay elsewhere. The UK and Bristol particularly held its own. We showed that we have the talent to match. The purpose of this note is not to name names – there is plenty of information on our connected sites and the participants’ sites for that – and i have a fear of missing somebody out and i wouldn’t want to do that! That said I feel I must give a special mention to my Musical Director Jay Wilcox. I cannot say more other than to say he was immense, garnering praise from all angles and especially from the US artists. I do hope he has gained some good contacts that he will be able to utilise on his projects in the future. I am sure he has and that, in a nutshell, is what it’s all about. During the course of the programme we basically re-wrote the agenda. It became less structured, less formal, less classroom. We just vibed off each other in small discussion groups, strengthening links, discussing and debating problems, learning from each other, expressing wisdom, tackling issues. The informality of it all, I believe, made the discussions more potent, and the bonds between us much stronger. I think we covered everything and more that the structured agenda would have coped with. a) Do some studio sessions, some work was done, some of it informal, some of it just playing around, but we made some music, stay tuned! Assisted by Riley and CoCo (Friday) and Luke Type (Sat), Jamell and Alex at the Controls. d) Give plays to new albums by Beverly Knight, Maya Azucena and TypeSun. f) have extensive discussions about hair! The Friday and Saturday performances were phenomenal. I know it was my event and I would say that but they were. The sound was superb, many thanks to A1 and Trinity, many of the artists commented on that. Held together and kept flowing by ‘The Diva’ Nikki Wade who was flawless, and Jay Wilcox and his band. Most of the sets were under rehearsed or even un-rehearsed, and the best compliment that i can give is that no one would have known. Friday was enhanced by a representation courtesy of Godfrey Fletcher and Neo2Soul Promotions, NuVybe and Saturday by DNyce, Soul-D-Out. Whist I am so pleased that the US came to the UK, I am equally pleased that the UK artists, from Bristol in particular, stood strong, and can stand shoulder to shoulder with their American Brothers and Sisters – you did us proud. with Trish n Tom, Nikki Wade, Khiry, Catt, Misty Sharp, Elegance, LaSonya Gunter, Celestine, Bashema,. 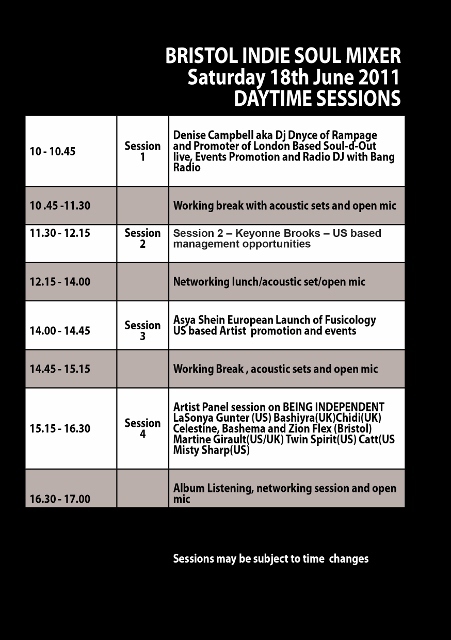 The UK does not have or has a lesser framework within which new soul artists can operate and perform. This is made harder because of the global economic crisis but also worsened by the fact that certain groups within the UK Soul World do not embrace live music as fully as, I believe, they should. The changes in the music industry and particularly the way in which people are buying (or stealing) music makes it even more imperative that live music becomes a strong income stream for an artist. It is no good any longer for people to just ‘buy the records’, that isn’t enough. I have never understood and never will understand why these groups of people will not support live performance and rather just sit and listen to the record. Soul Music is built on cultural history of hurt and pain and this gives it the deep and emotional content that we all love so much. That SOUL is shared between participant and audience in live appearance. That connection when you get it will be more powerful than any record. We therefore need to support live music to embrace performance as it is inclusive of music, history and identity. The alternative is music made in a bedroom or a personal studio that is mechanical, bland, and devoid of the passion that we so desire. I am pleased to say that I feel that for our first event in the UK we are still intact, we can move forward on the basis that we have introduced something that was different and difficult for people to grasp, we have the drive to take it to the next level, we need to do this, we need to evolve and mould the concept into something that retains its closeness and tightness but appeals more to a bigger audience. This i am sure we can achieve . Most importantly we need to continue to give the artists the platform to facilitate, enhance and further their careers for the public benefit. We do this but there is no complacency. From those that came and participated we received nothing but positive energy, this gives us the strength to carry on, enhance what we do. Indie Soul Mixer is strong with annual events now in New York, Atlanta and now Bristol – look out for additional venues worldwide. Thanks – this is going to sound like a CD cover!! The people who travelled across from the USA at their own expense, and gave what you gave, we love you each and every one of you. To anyone who has helped, even on small things, they matter to and you are appreciated as much as the ones who gave big. To Ujima Radio, Roger, Tim and Kevin, and presenters Maizee Maiz, Nia, Mistri and DJ Style and all the other DJ’s who supported us. To The Canteen, Stokes Croft for Sunday afternoon. To Steve Lloyd (Surecom Limited) for the website. To DJ’s, Websites, Bloggers, Radio Stations, Shops and Venues we have flyered, and anyone who has given us mentions or helped us spread the word. And most of all I want to extend my deepest gratitude and love to Beki for her time and commitment to the project (at the expense of her own work). We have been stressed, she has been stressed but ultimately we had the strength to see it through. When Bashema was just 3 years old, she would get her mum’s pots and pans out of the kitchen and arrange them in the front room like a drum kit. Along with her toy piano, this was her musical debut. When Bashema was 4 years old, her mum bought her a Yamaha keyboard which she taught herself to play by listening to tunes on the Radio/TV and then trying to copy them on her keyboard. From the age of 8 she started writing poems and stories; at 12 she started singing in her school gospel choir and started taking piano lessons, but, unfortunately was unable to continue with her piano lessons so went back to teaching herself. Upon leaving school, Bashema studied performing arts at Filton College. 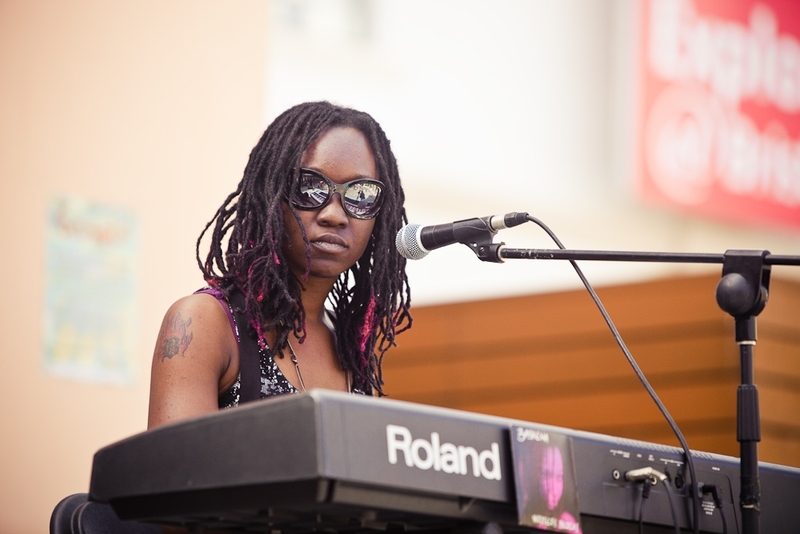 There she met like-minded musicians and began performing live with her Yamaha keyboard at various Open-Mic Nights in Bristol. 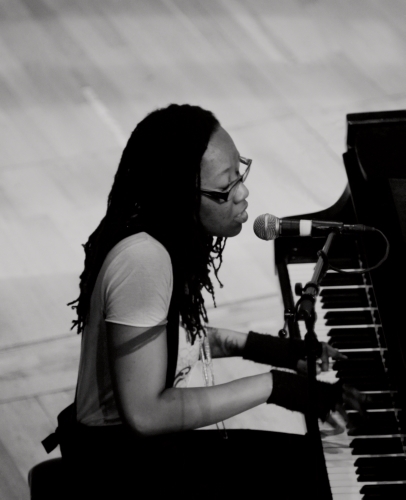 At 19 she secured a place and attended the prestigious Access to Music College in Bristol. After finishing college, she worked at Oppo Music bar where she ran her own Open Mic nights, promoted music events, and performed regularly. In 2008 she started working at BCFM Radio co-presenting The Bristol (UK) Music show with Steve Parkhouse. Shortly after, she was invited to be a guest on local Bristol record label, Jelli Records. In 2009 she performed at Glastonbury Festival playing on the Bandstand stage and live on Worthy FM Radio. Jelli Records has produced Bashema’s E.P titled, ‘Writer’s Block!’, and her Double Single titled, ‘Liberty’. Bashema (along with local musician Trish Brown) have written and released a single for ‘Cots for Tots Charity’ titled, ‘Lullaby’. The single was recorded at St George’s Hall with backing from the Bristol Ensemble String Quartet. All of Bashema’s music is available on iTunes and all major download sites. Celestine was born in Bristol and rose to national recognition when winning the grand final of the BBC TV programme “Star for a Night” with a stunning performance of the Nina Simone classic ‘Feeling Good’. This led to performances at the Royal Variety Show, The Albert Hall and the opportunity to work with a diverse range of producers -True North, Stargate, and songwriters Gary Barlow, Tony Moore. However break-through at that point was not to be. •	Crucial Records on ‘Garage Gospel Volume 1’ track ‘All of Me’ with Nigel Ipinson-Flemming (The Stone Roses). •	Celestine then collaborated with Sonic Syringe to produce a 5-track EP called ‘Inside’. In 2009 one of the tracks, [These Streets] reached No. 1 in the Ujima 98fm Charts and remained at No. 1 for 6 weeks; it also received airplay from BBC Radio Bristol. ‘Inside’ was the start of the journey to find her true place in her musical journey. Performances followed with regular spots at The Coronation Tap and local and national festivals and as support act for Pee Wee Ellis/Fred Wesley, Tarrus Riley/Etana, John Holt/The Temptations at o2 Academy and Mica Paris. This next stage is her journey brings to the table the 12-track album “Secret Side”, recorded entirely with live musicians – With many of the lyrics penned by Celestine herself, Secret Side is on occasion “a funksome blend of soul and jazz…with a voice of perfect poise coming through…” In addition tracks like ‘This Baby Still Cares’ and ‘Prophecy’ shows her more mellow jazz style. “Secret Side” is a great addition to all music lovers’ collections. Celestine has a natural jazz/soul vocal style which moves effortlessly through different genres of music – “a singer with a really hauntingly beautiful voice” and “an inner beauty that shines through”. Celestine is at her best when performing live and has captured the essence of her live performances and song writing on her debut album ‘Secret Side’. Infusing Soul, Jazz, Funk and Blues rhythms with velvet vocals, ‘Secret Side’ has songs to suit all moods. Secret Side is available for download on iTunes, CDbaby and Amazon MP3; physical copies from http://www.amazon.co.uk.